Keeping your lawn beautiful, fresh, clean, and green can be difficult sometimes. Fertilization is one of the best turf treatments to use to maintain quality turf to enjoy your landscape. If you are a homeowner with a beautiful lawn, you will need to maintain it to keep it that way. You may want to consider some helpful tasks to keep your turf in good condition. 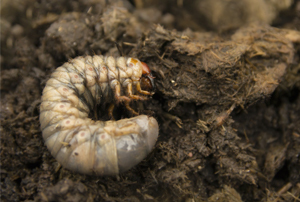 Or better – consider professional turf treatments that will keep your lawn look green, healthy, and insect-free. 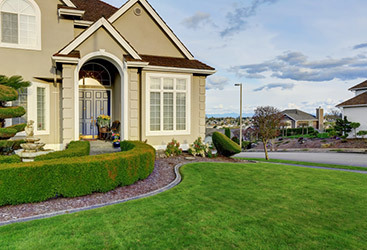 The benefits of proper lawn maintenance go beyond the obvious. As the grass grows, it helps the lawn by reducing air pollution, dust, heat, glare and stabilizing soil. Surveys show that well-landscaped and attractive lawns can even increase the value of your home. Take care in the maintenance and selection of your lawn turf and you’ll be able to reap the rewards of a beautiful lawn. By making the right choices (using the right turf treatments, high-quality products, and professional lawn care services) you can create a green lawn that will grow without pesticides and minimal maintenance needed. If you want to maintain quality turf in your lawn – fertilization is the best turf treatment to use. Fertilization will give you a dense and healthy stand of turf that maintains a green color. It also helps you get rid of weeds. Nitrogen is the most important ingredient of every lawn and each type of grass requires different amounts to stimulate performance and peak growth. How often you fertilize doesn’t affect only your lawn appeal, but the maintenance level as well. The more you fertilize, the more grass you will have to mow. Using the right fertilizer is the easiest and quickest way to provide the nitrogen your turf needs. Get the proper soil Ph. Getting the right level increases the effectiveness of any fertilizer you use. Organic fertilizers: These fertilizers include composts, manures, and byproducts that might be wasted otherwise. Natural organics include low amounts of nutrients that are released very slowly. Using too much won’t make any damages, however, it is good to be careful. Some homeowners may include weed seeds (seeds that don’t contain blood meal, alfalfa, soybean meal, and etc). Chemical fertilizers: These fertilizers are more concentrated than organic and are easier to use. Also, they are unlikely to damage your lawn, especially if applied carefully. Water-insoluble nitrogen or WIN is the most popular chemical fertilizer and usually is added half or more. The chemical fertilizers don’t produce a quick effect. That is better for the turf. Fast-release fertilizers: The best way to green-up your turf is by using fast-release fertilizers. They are inexpensive, concentrated, and super easy to apply. Spreading too much of these fertilizers, especially in warm weather can destroy the turf. If you don’t want to deal with fertilizers or wasting your time mowing and taking care of your lawn, hire Green Turf Care and let professionals fertilize your lawn. Green Turf Care uses their own lawn fertilizer process (it includes 6 steps) that give you the beautiful lawn you aspire to enjoy. When you should apply fertilizer to your turf depends on your lawn and the type of grass you maintain. Your grass needs nitrogen and other ingredients during the season of growth. If you fertilize your grass while it is naturally growing, you are only wasting fertilizer. If you space your applications far apart, your grass will grow fine for some time and then will slow down. Warm-season grasses grow rapidly during the winter season. You need to feed these grasses from spring to early fall. Feeding the grass too early, the nitrogen will stimulate rapid growth of weeds and you don’t want that. Fertilize too late and the grass is likely to be less hardy and susceptible to cold injuries. Cool-season grasses grow vigorously in the colder months. The most important time to feed these kinds of grasses is in spring and fall. Fall especially is an important season to fertilize cool-season grasses. You will keep them growing longer and providing the reserves needed for green-up in the spring season. You should avoid fertilizing these grasses too early in spring as you will end up with lush top growth and that can mean only one thing – trouble. For maximum appearance, the lawn should be fertilized about once every two-three months during the active-growth period. Our advice is to break up the yearly amounts of nitrogen into the right number of applications. For example, one or two in late spring, two or three in early fall, and three over the summer. Fertilizing once in spring and once in fall is enough for cool-season grasses. Fertilizing once in early summer and once in late summer is enough for warm-season grasses is enough. If you got less time, we recommend fertilizing cool-season grasses in early fall while the warm-season grasses in spring. Remember – no more than 1 pound of nitrogen per 1000 square feet/application. If you are having troubles keeping up with fertilization and proper care, give Green Turf Care a call! Known as the best turf care company on the market, Green Turf Care is passionate about improving the look of your lawn and take care of your turf for good. In order to achieve an attractive and healthy lawn look, it is important to understand that proper green lawn maintenance is required. Cutting the grass and mowing regularly is not enough. Regular mowing and watering are necessary, however, fertilizing is equally important. If you desire that nice-looking healthy appearance, lawn fertilization is a must! One benefit of lawn fertilization is that your turf will require less weed killer. Healthy and thick lawn creates resistance to weed growth which is great. The weed is stubborn and sometimes difficult to get rid of. With fertilization, these weeds will have a much harder time spreading in your yard. Also, these persistent weeds may require specific killer ingredients. A well-fertilized turf will cause a reduction of stubborn weeds and their activities. Strengthening the root system of your turf is another benefit of lawn fertilization. Roots can absorb water quickly, especially during rains. 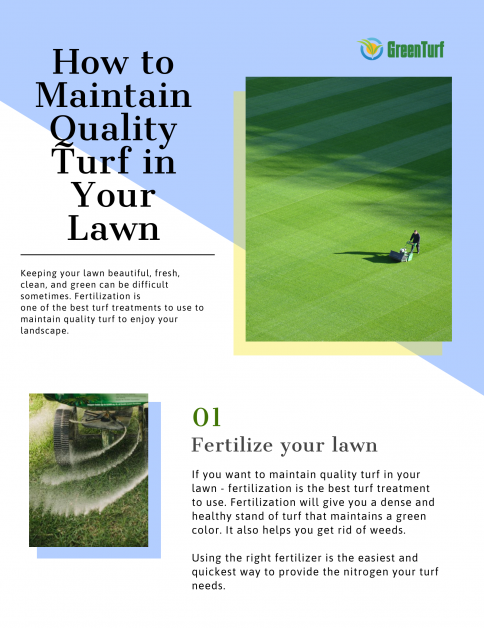 Without a properly fertilized lawn, the turf will lose that lush green and healthy appearance and will start turning yellowish-brown as the summer season heats up. Another benefit that will do good to your lawn is disease resistance. With fertilization, grass has the right ingredients to grow stronger and is less prone to various diseases. You need to remember that turf is alive and it needs the right nutrients to keep growing and avoid illnesses. Grass pulls nutrients from the soil to develop and grow. As a result of fertilization, the grass becomes thicker and helps remove soil runoff. Fertilized soil is less likely to become drained when rain and storms come. Strong and healthy soil will promote healthy grass now and in a few years from now. Consider this as an investment in the future of your lawn. Finally, a green and healthy lawn that is regularly fertilized, is more resistant to creeping beggarweed. The thicker your turf grows, the harder it is for creeping beggarweed to grow. Should You Fertilize On Your Own or Hire Turf Care Company? Save Money: Maintaining your own lawn may seem less expensive, however, in time it would cost you more. After all, you need to get high-quality products and machines and that’s not cheap. Great Exercise: Getting out there in the yard to do some work is one way to get in shape. It is one of the reasons why some homeowners decide to do their own lawn maintenance. Taking Pride: Some homeowners like the idea of taking care of their own lawn and may take pride in using organic fertilizers. However, that price can vanish if the work doesn’t seem right and you don’t have the right skills or knowledge to use fertilizers. Hidden Costs: Fertilizing your lawn by yourself can have initial savings. However, it is also important to recognize that these costs are hard to predict. Without a turf care company, there are a lot of things that can go wrong. Bad Results: Without expertise, you might not get the results you want. Or worse – you might spend all of your money until you find the right type of fertilizer, nutrient, and etc. Time-Consuming: You may think you have plenty of time to mow, fertilize, and seed your lawn, however, the process is more time consuming than you think. 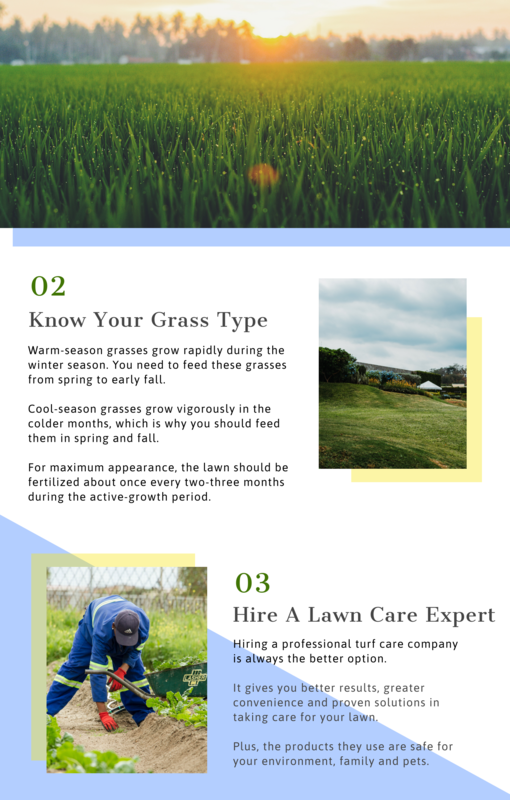 Keep in mind that lawn maintenance is an overwhelming project and include multiple trips to the store, cleaning, waiting for the right weather conditions, and etc. Better Results: By hiring a professional turf care company, you will get better results. Green Turf Care provides organic-based fertilizers. They blend organics into the fertilizers and that is what makes their lawns nice and green. Solutions for Creeping Beggarweed and Other Types of Weed: Professional lawn care companies like Green Turf Care have trained experts who know exactly how to diagnose creeping beggarweed and other types of unwanted weeds and solve the problem. Having someone to diagnose and solve the problem for you saves a lot of time, money, and energy in the long run. It is very common for homeowners to misdiagnose certain issues and waste time and money on wrong products. This could lead to damaged turf. Convenience: Although doing your lawn by yourself seem easy and simple, having someone to do it for you is a lot easier. What seemed like an easy and fun activity at the beginning turns into a burden when you’ve realized how much skill, time, and work is actually required. Increased Safety: Professional lawn care companies work with expensive and cutting-edge materials for years. These products can not only work faster but also safer than some products in your home. The experts at Green Turf Care are trained to use the right devices and practices that protect people, environment, and pets. Since we can see both options, in our opinion to the question – Should I take care of my own lawn? Is definitely NO! It is simply not worth the headaches, frustration, and hassle to try and save a few dollars when you can have a professional to take care of everything. The benefits of hiring turf care lawn service outweigh the cons. The value the company will provide to your property and life is definitely worth the investment. If you are looking for a nice green lawn and you’ve called a few companies so far, the chances are you’ve found lawn care companies who are unprofessional, companies who didn’t pick up, companies who ask you to fill in couple applications, and etc. You are frustrated and we can see why – you are having a lawn problem and all you want is someone to come, take a look, and offer you the best solution possible. 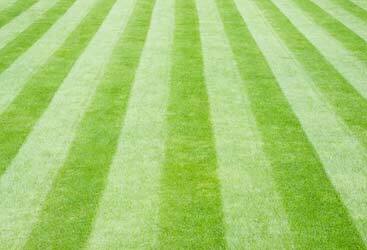 Green Turf Care Lawn Service is passionate about meeting your lawn care needs and serving you! Green Turf Care is not a franchise, but a local family-owned company offering a 6-step fertilization program to help you maintain quality turf and nice and healthy lawn. Known for their speedy and effective service, your free quote will be ready in less than 12 hours. This is a professional service you can trust. Get in touch with your Pennsylvania lawn care professional today and meet the team that truly enjoys their job! Call us or full the contact form here to schedule an appointment! Give your lawn the best turf treatment it deserves!